Article "Denver, June 17. — The Rev. John L. Dyer, one of the most famous preachers who has figured in the history of the west, died of paralysis of the throat after a lingering illness. Mr. Dyer was born in Franklin county, Ohio, in 1812. "Father" Dyer, as he became known, began preaching in Wisconsin in 1849, and was the oldest, if not the last of the old Methodist "circuit riders." Coming to Colorado in 1861 he met many thrilling adventures in his travels in this state and New Mexico, and through his zeal in preaching to the widely separated and almost inaccessible mining camps in ail kinds of weather earned the sobriquet of "The Snowshoe Itinerant" He is the author of a book bearing that title." He preached at least once in Colorado City, where Rev William Howbert was pastor of its first Methodist Church. John Lewis Dyer was a methodist minister from Minnesota. As a young man, he fought in the Black Hawk Wars and worked as a lead miner in Wisconsin. He was "called by God" in middle age to preach, and began his career in Minnesota. Originally coming to Colorado in 1861 to see Pikes Peak, he decided to stay and preach to the settlers and miners of the region. Settling in the town of Buckskin Joe, Father Dyer established himself over the next 29 years and became a frontier legend. 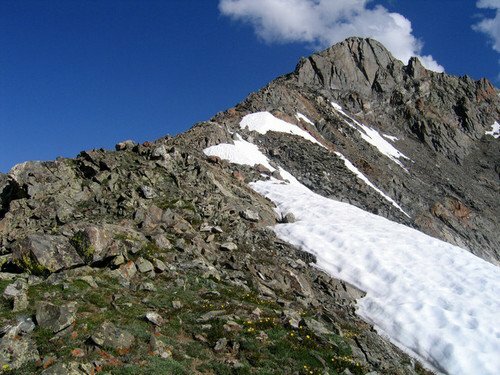 Carrying the word of God over the mountians, he crossed 13,000 foot Mosquito Pass several times per week in all weather conditions. He fashioned long ski-like foot covers for the long winters and called them "snowshoes." He preached against many of the favorite activities of miners - gambling, drinking, and prostitution. He married, attended the sick, and gained a reputation as a truly selfless individual. When he needed money, he carried mail to and from the mining camps on preaching trips. A rugged, sturdy man, he wasn't above giving a miner a good thrashing when he was heckled. Father Dyer has become part of Colorado legend. He is immortalized in the Colorado State Capitol building in a stained-glass likeness along with 15 other founders of Colorado. There are two mountains in the Tenmile-Mosquito Range named for him - this one and Dyer Mountain. 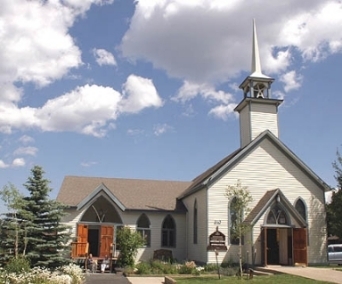 The Father Dyer United Methodist Peak in Breckenridge was built by Father Dyer in 1880, mostly by hand.